#FeatureFRIYAY: Yuki, Exact Online & BigQuery connectors and more! July is almost over! Although we’re right in the middle of the summer holidays, our product team hasn’t sat still. Instead of talking about the heatwave, let’s talk about the wave of new Cumul.io features that were developed this month! Starting now, we’ll do a #FeatureFRIYAY every last Friday of the month to keep you up-to-date about what’s new in Cumul.io. Time to wrap up what changed in July! We’ve added a couple of new plugins, which will help you connect data from a number of data sources more easily. Let’s have a look at the ones we added this month. Looking for more insights into your financial data, like your balance & income or transactions? It’s now possible to connect with Yuki in just a few clicks! Yuki is a modern accountancy platform which helps accountants and entrepreneurs to work together more efficiently on a company’s finances. Connecting your Yuki data to Cumul.io has many advantages. Get a full oversight of the financial status of your company, in real-time. You’ll be able to follow up your own financial status in the blink of an eye, in much more detail. Gain more insights in less time! 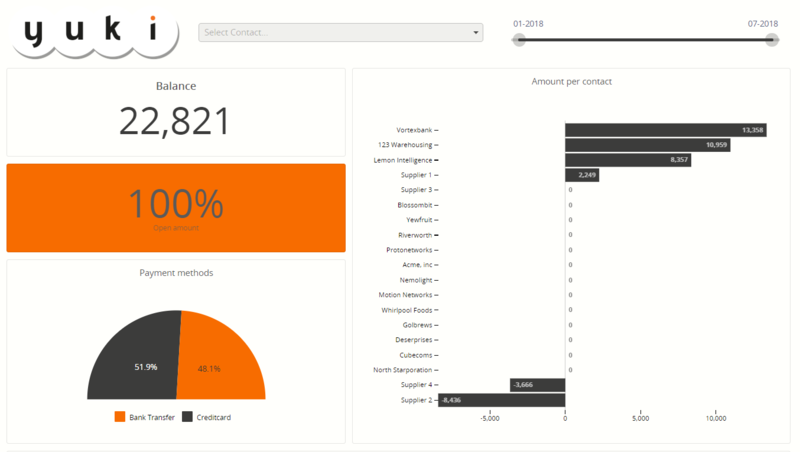 It’s possible to make a fully customized dashboard, or to use one of our 1-click-template dashboards. Learn more about our Yuki integration, or check out an example dashboard. 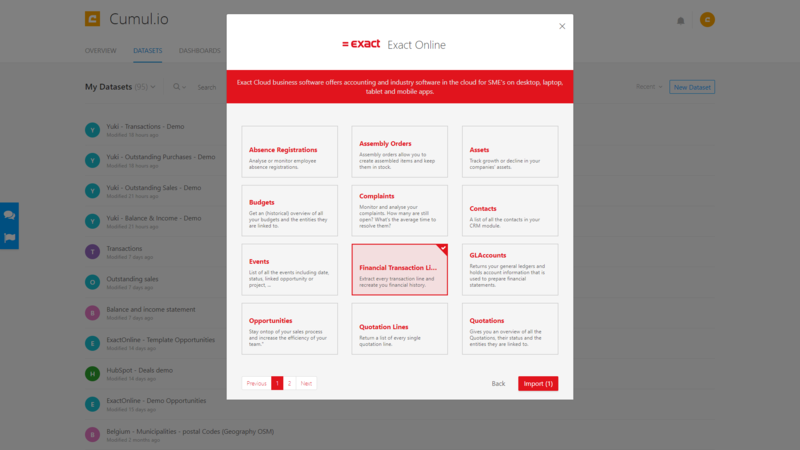 Since Exact Online is a very multi-functional software (financial, accounting, CRM,…), it contains a lot of valuable data. With our new plugin, it’s possible to analyze all that data in Cumul.io, and link it to other data from Teamleader, Excel or even your own database. Just like Yuki, we have template dashboards available for Exact Online as a fast solution, but it’s also possible to fully customize the insights you value most. Try out the Exact Online connector, or check out an example dashboard. We’ve built a connection with BigQuery, Google’s scalable data warehouse for enterprises. While you collect & store data from disparate sources in Google BigQuery, you can use Cumul.io’s BigQuery plugin to present that richness of data in a much more visual way. For data analysts, it’s the perfect way to transform these raw data into actionable insights, easily readable by anyone in the organization. See? It’s as easy as that! Chart integration gives you more flexibility. You might want to show the whole dashboard in 1 part of your app, but just 1 or 2 charts in another part. With chart integration, you can easily do so from 1 master dashboard, without having to create multiple derivations to embed. Find the reference code and examples in Cumul.io’s developer documentation. Last month, we released our new Developer Documentation with references & examples on how to use our Core API & Integration API. We’re continuing to put effort into the documentation, to make sure our integration process is as smooth as possible for developers. This month, we added documentation on the Cumul.io Plugin API. It explains how you can easily create & register a new plugin, which enables you to build a connector to any data source you like. Now, you can do the same for column charts, bubble charts and treemaps! Simply enable or disable the toggle via the chart settings to show or hide the value of each column. Are you regularly using pie charts or donut charts? Bring some variation to your dashboard with semi circle charts! These charts can be used in the same way, only they will show the proportions on a half circle instead of a complete one. It will take up less space in your dashboard. Feature Highlight: Lat/Lon Coordinates Support & WebGL rendering!